Today, the Budget session of Parliament has begun and President Pranab Mukherjee addressed the joint sitting of the Lok Sabha and the Rajya Sabha.The Economic Survey has tabled in Parliament by Finance minister Arun Jaitley on the first day of Budget Session. Economic Survey says economic growth to return to normal as new currency notes in required quantities come back into circulation and follow-up action on demonetisation is taken. The CPI based core inflation remained stable in the current fiscal year averaging around 5 per cent. The Economic Survey says that the rupee performed better than most of the other emerging market economies.The total area coverage under Rabi crops as on 13.01.2017 for 2016-17 is 616.2 lakh hectares which is 5.9 per cent higher than that in the corresponding week of last year. The area coverage under Gram (Channa Dal) as on 13.01.2017 for 2016-17 is 10.6 percent higher than that in the corresponding week of last year. • The Union Government expects the real Gross Domestic Products (GDP) to be in 6.75% to 7.5% during fiscal year 2018. • The survey pegs GDP growth rate at constant market prices for the current year 2016-17 is placed at 7.1%. 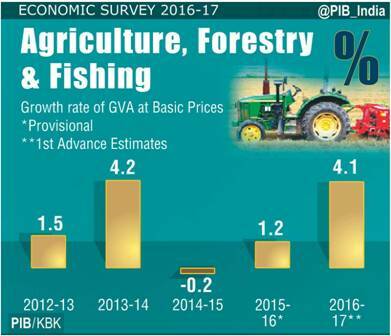 • Agriculture sector to grow at 4.1% in the current year which is up from 1.2% in 2015-16. 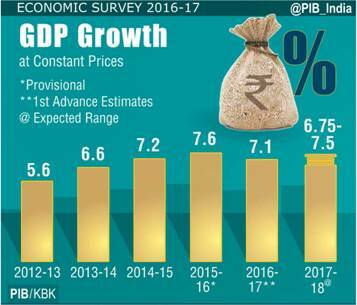 • Gross domestic product (GDP) growth in 2016-17 to dip to 6.5%, down from 7.6% in last fiscal. • Economic Survey sees fiscal windfall from Pradhan Mantri Garib Kalyan Yojana, low oil prices. • Growth rate of industrial sector estimated to moderate to 5.2% in 2016-17 from 7.4% last fiscal. • Prescribes cut in individual I-T rates, real estate stamp duties. • Income Tax net could be widened gradually by encompassing all high income earners. • Time table for cutting corporate tax should be accelerated. • Tax administration could be improved to reduce discretion and improve accountability. • Growth to return to normal as new currency comes in circulation. • Demonetisation to affect growth rate by 0.25-0.5 per cent, but to have long-term benefits. • Fiscal gains from GST will take time to realise. • Demonetisation may affect supplies of certain agricultural products like sugar, milk, potatoes and onions. • Growth rate of industrial sector to moderate to 5.2 per cent this fiscal, from 7.4 per cent last fiscal. • Efforts to collect taxes on disclosed and undisclosed wealth should not lead to tax harassment. • Universal Basic Income Scheme is an alternative to plethora of state subsidies for poverty alleviation. • GST, other structural reforms should take the trend growth rate to 8-10 per cent. • The survey was prepared by the finance ministry's chief economic adviser Arvind Subramanian. • As per the advance estimates released by the Central Statistics Office, the growth rate of GDP at constant market prices for the year 2016-17 is placed at 7.1 per cent, as against 7.6 per cent in 2015-16.This estimate is based mainly on information for the first seven to eight months of the financial year. Government final consumption expenditure is the major driver of GDP growth in the current year. • Fixed investment (gross fixed capital formation) to GDP ratio (at current prices) is estimated to be 26.6 per cent in 2016-17, vis-à-vis 29.3 per cent in 2015-16. • For 2017-18, it is expected that the growth would return to normal as the new currency notes in required quantities come back into circulation and as follow-up actions to demonetisation are taken. On balance, there is a likelihood that Indian economy may recover back to 6 ¾ per cent to 7 ½ per cent in 2017-18. • Indirect taxes grew by 26.9 per cent during April-November 2016. • The strong growth in revenue expenditure during April-November 2016 was boosted mainly by a 23.2 per cent increase in salaries due to the implementation of the Seventh Pay Commission and a 39.5 per cent increase in the grants for creation of capital assets. • The headline inflation as measured by Consumer Price Index (CPI) remained under control for the third successive financial year. The average CPI inflation declined to 4.9 per cent in 2015-16 from 5.9 per cent in 2014-15 and stood at 4.8 per cent during April-December 2015. • Inflation based on Wholesale Price Index (WPI) declined to (-) 2.5 per cent in 2015-16 from 2.0 per cent in 2014-15 and averaged 2.9 per cent during April-December 2016. • Inflation is repeatedly being driven by narrow group of food items, of these pulses continued to be the major contributor of food inflation. • The CPI based core inflation has remained sticky in the current fiscal year averaging around 5 per cent. • The trend of negative export growth was reversed somewhat during 2016-17 (April-December), with exports growing at 0.7 per cent to US$ 198.8 billion. During 2016-17 (April-December) imports declined by 7.4 per cent to US$ 275.4 billion. • Trade deficit declined to US$ 76.5 billion in 2016-17 (April-December) as compared to US$ 100.1 billion in the corresponding period of the previous year. • The current account deficit (CAD) narrowed in the first half (H1) of 2016-17 to 0.3 per cent of GDP from 1.5 per cent in H1 of 2015-16 and 1.1 per cent in 2015-16 full year. • Robust inflows of foreign direct investment and net positive inflow of foreign portfolio investment were sufficient to finance CAD leading to an accretion in foreign exchange reserves in H1 of 2016-17. • In H1 of 2016-17, India’s foreign exchange reserves increased by US$ 15.5 billion on BoP basis. • During 2016-17 so far, the rupee has performed better than most of the other emerging market economies. • At end-September 2016, India’s external debt stock stood at US$ 484.3 billion, recording a decline of US$ 0.8 billion over the level at end-March 2016. • Most of the key external debt indicators showed an improvement in September 2016 vis-à-vis March 2016. The share of short-term debt in total external debt declined to 16.8 per cent at end-September 2016 and foreign exchange reserves provided a cover of 76.8 per cent to the total external debt stock. • India’s key debt indicators compare well with other indebted developing countries and India continues to be among the less vulnerable countries. • Agriculture sector is estimated to grow at 4.1 per cent in 2016-17 as opposed to 1.2 per cent in 2015-16; the higher growth in agriculture sector is not surprising as the monsoon rains were much better in the current year than the previous two years. • The total area coverage under Rabi crops as on 13.01.2017 for 2016-17 is 616.2 lakh hectares which is 5.9 per cent higher than that in the corresponding week of last year. • The area coverage under wheat as on 13.01.2017 for 2016-17 is 7.1 percent higher than that in the corresponding week of last year. The area coverage under gram as on 13.01.2017 for 2016-17 is 10.6 percent higher than that in the corresponding week of last year. 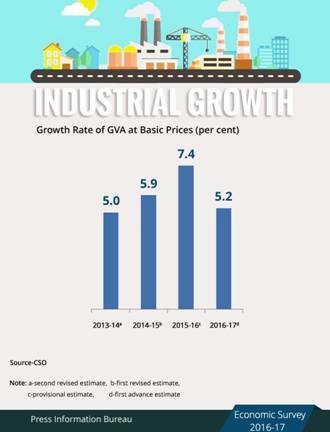 • Growth rate of the industrial sector is estimated to moderate to 5.2 per cent in 2016-17 from 7.4 per cent in 2015-16.During April-November 2016-17, a modest growth of 0.4 per cent has been observed in the Index of Industrial Production (IIP). • The eight core infrastructure supportive industries, viz. coal, crude oil, natural gas, refinery products, fertilizers, steel, cement and electricity registered a cumulative growth of 4.9 per cent during April-November 2016-17 as compared to 2.5 per cent during April-November 2015-16. The production of refinery products, fertilizers, steel, electricity and cement increased substantially, while the production of crude oil, natural gas fell during April-November 2016-17. Coal production attained lower growth during the same period. • The performance of corporate sector (Reserve Bank of India, January 2017) highlighted that the growth of sales grew by 1.9 per cent in Q2 of 2016-17 as compared to near stagnant growth of 0.1 per cent in Q1 of 2016-17. Growth in net profit registered a remarkable growth of 16.0 per cent in Q2 of 2016-17 as compared to 11.2 per cent in Q1 of 2016-17. • Service sector is estimated to grow at 8.9 per cent in 2016-17, almost the same as in 2015-16. It is the significant pick-up in public administration, defence and other services, boosted by the payouts of the Seventh Pay Commission that is estimated to push up the growth in services. • The Parliament has passed the “Rights of Persons with Disabilities Act, 2016”. The Act aims at securing and enhancing the rights and entitlements of Persons with Disabilities. The Act has proposed to increase the reservation in vacancies in government establishments from 3 per cent to 4 per cent for those persons with benchmark disability and high support needs.